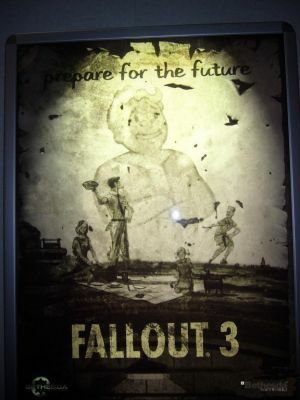 CVG has posted a short article accompanied by the Fallout 3 poster from this year's E3, a lot nicer than the last one. He's back! PipBoy, that cheeky nuclear awareness mascot that charmed us so much back in seminal masterpieces Fallout 1 and 2, has made a return to E3 - albeit only in paper form so far. Somewhat quelling the fears of Fallut fans that Bethesda might overlook the humour, charm and fifties stylings of the series, the Fallout kid's return seems to promise this won't be the case - and that's certainly great, great news for Fallout obsessives everywhere. The art style certainly is promising. There are 69 comments on this article. Click here to comment.